Once again, Memorial Day is upon us and I, like many of you will be enjoying picnics and early summer fun with family and friends. However, Memorial Day is so much more than picnics and the pool - it's remembering the sacrifice of so many brave men and women who not only have fought and died for our amazing freedom, continue to stand in harms way for us every minute of every day. 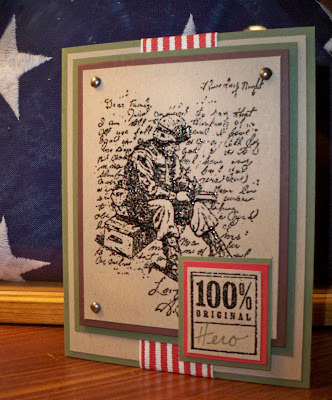 My Blogger's Challenge card today is made in honor of all those who have nobly and honorably served our country. I can think of a few 100% Original Heroes in my life - my Father and Uncle Rudolph who served in Korea, our family friend Greg Rawlings who served in the Persian Gulf and has just returned from 15 months in Iraq and our friend Jake who is serving currently as well. Thankfully, they were not called upon to give the ultimate sacrifice, but their duty and burdens are and were the same - Protect and Defend our great nation. If you have time this weekend, make a stop by one of our many national cemetaries. Visit a service or war memorial. Take the time to teach your kids about the real meaning of Memorial Day. When you fly your flag from your front porch, recall how that flag stands for freedom across the globe. Because freedom isn't really free - it comes with a cost. One that our service men and women gladly pay. God bless you and your families this weekend and God Bless America! Such a beautiful Tribute to America's Heros! Great card. That image is so perfect and I love the little sentiment in the corner. Wow Robin! Beautiful card! I love it! Great job Robin! I always loved this set and was surprised that it didn't make it in the big catalog. Beautiful card! Your card is just breathtaking!!! I am in love with this stamp and now must have it!!!! Great card and great job showcasing this awesome image!!! I have an ex-brother-in-law who served and has since died from an illness picked up over there. Very sad!!! I love it! Not your traditional red, white and blue, but so patriotic and touching. Love this Robin. Very nicely done. Wowza! This is one beautiful card!!! Absolutely wonderful! This image looks stunning embossed - beautiful. your card is just beautiful...and your tribute to America's Heros is so touching. thank you! This is a great project---wonderful way to honor those who serve our country. Beautiful...awesome card, Robin! I have this set and will be casing yours for sure! This is awesome, Robin. Love how you added the little tag. What a beautiful card; simply wonderful. Your eloquent tribute is very touching. Thank you for helping us all to remember our heroes, those who protect us every day. What a lovely tribute to our country's heroes!